The city of Ragusa, important centre rich in baroque art evidences, is the capital of the province which is located further south in Italy. Villa del Lauro fits perfectly among the homes of its historic centre, among the buildings belonging to wealthy nobles and charming churches, helping to create the magical atmosphere that one feels walking through these streets filled with history and stories. The building that houses the Villa del Lauro is a magnificent example of Baroque art, constructed according to the rules of civil architecture typical of the nineteenth century. The restoration, carried out in accordance with the original materials and paying attention to individual details, brought to light the splendour of ancient times and has transformed the villa into a charming residence, unable to reconcile modernity and tradition. The rooms at Villa del Lauro rise from the renovation of the old building and are therefore all different from each other. There are 15 rooms in total, divided into two categories and distributed in the 2-floor Villa, no elevator available. All rooms offer complimentary the minibar and the internet connection Wi-Fi. 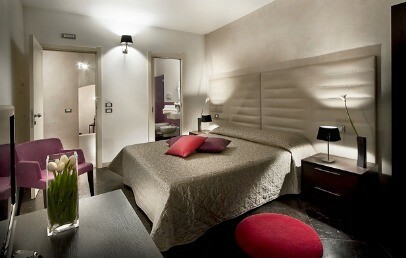 The Superior rooms have a surface of 18 to 25 sqm and have a bathroom with shower. Some have a balcony and some with garden view. The Deluxe rooms have a surface of 40 sqm, two of them are built of stone and have a French-bed; the others are made like a loft. Most bathrooms have a shower, except one room made of stone, has a tub. Some Deluxe rooms have garden view. For those who love outdoor sports, the Villa del Lauro offers the possibility to make excursions by mountain bike, trekking, caving, quad biking, rubber dinghy and horseback riding. Villa del Lauro offers breakfast service. The staff is at guests' disposal for tips on the best restaurants, where one can taste the local delicacies. A fragrant Italian garden surrounds Villa del Lauro, giving it a pleasant and comfortable corner where guests can relax. The garden is also the backdrop to the elegant swimming pool, located on two levels, equipped with whirlpool. Guests can also book excursions in the area and wine tasting tours. Tourist tax – The municipality of Ragusa requires the payment of a tourist tax of € 1.50 per person/night to be paid on spot and to apply for a maximum of 7 consecutive nights and from mid March to end October. Children under the age of 12 are exempted. Spacious double bedrooms with a private bathroom with shower. Some rooms have a balcony, some have view on the garden. They have Wi-Fi internet access, pool towels, complimentary toiletries and minibar. Only for Charming customers: welcome drink in the room on arrival!